My brother flew out last year from Delaware to Colorado for a week of dirt bike and street riding. We had a great time but had a major glitch. I managed to blow up my Yamaha FZ1 ECU 2 days before he flew out (long story). I could not find one in time so I had to borrow a bike so we could do the 4 day Colorado ride we had planned. A good buddy of mine up in Denver had a Ninja 650 he let us use and I returned it with a new set of tires as thanks for the loaner. My brother rode the Ninja and I rode my VFR. We had a blast and decided to something again this year. A few weeks before he came out he called and said “think big” this year. So about a week before he got here we decided on a Colorado to the California coast ride. I had everything ready, the FZ1 and VFR were packed, oil changed, etc. He called and said he was on the way to the airport in Philly, everything was going according to plan. It was about 2pm on Friday and our ride was going to start the next morning. I hopped on the VFR to go fill up the tank and only got a few blocks away when my radar detector started to glitch and die. Been down this road before, I knew I had a charging problem. I get back in the garage and sure enough no charging on the battery. I had mentioned to my brother a few weeks back that I should get a new stator just in case. This would be my third bad stator at 92,000 miles, but I did the math and figured the current one only had about 15K miles on it and I should be fine. The first two lasted around 30-40K miles each. I tear off the ride side and unsolder the yellow wire connections. 0 ohms to ground on all legs…OMG…I am SCREWED, and can’t believe this happened two years in a row right before our big ride. I call everywhere in Colorado, no stock, and I don’t have time to have one shipped from online. I called my brother and he was at the gate ready to board….”Greg, you are not going to believe this”…At first he thought I was joking for sure. Checkmate….maybe… I texted Miguel who just happened to be off that day after a night shift. “Miguel, I might need a really big favor, give me call when you can.” Miguel called about a half hour later and I explained the situation. “Can I borrow your bike?....where ya going?....California..for nine days…..OK, I will go get it ready for you”. My wife just happened to get off early that day and about an hour after discovering the deep fried stator I was in Miguel’s garage with my riding gear. Another miracle when I looked at the tires, he had recently put a new set of PR4s on so the bike was ready to roll! I promised to take good care of the Veefalo and would put a new set of tires on or pay for a new set if these came back with some life. I had ridden the Veffalo a few times when we swapped bikes out on a ride, but never more than an hour or so. He showed me the heated grips (which turned out to be extremely useful) and gave me all his wiring so I could hook up my stuff. I got back and started packing up the Veefalo and got my radar working…I was ready to go! I had to drive up from the Springs to Denver to pick up my brother who got in around 9pm. I made him suffer all the way home until I opened the garage door there sat the Veefalo and the FZ1….WHOOT ! Early the next morning we were off to Salt Lake for the first leg, 552 miles. The 1200 was very comfortable and I was glad for the tires. It absolutely poured the last 120 miles into Salt Lake. We went by the seat of our pants and made no reservations anywhere, just finding hotels each night, which was never a problem. Sunday- Salt Lake to Truckee, CA – 549 miles. We stayed at my high school buddies house, who would join us on his Connie14 later in the week. Monday- Truckee north, then into Red Bluff. We had skipped Lassen Volcanic park and calculated that we actually had enough time to make it from Red Bluff to Eureka that same day. So off we went on the famous route 36, and a 142 miles of corners. I had always thought Colorado was the best…maybe for scenery and some great roads…but nothing like this….it was truly 142 miles corners, elevation changes, and hardly any traffic. Veefalo loved the bigger sweepers but was a bit of handful in the really tight stuff. Fun for sure, just had to muscle it bit more than my sixth gen. But nobody heard me complaining!! I was so happy to be there. We made it into Eureka and got a hotel. Tuesday was Eureka to Yreka. Rt. 299 was also superb climbing away from the coast. Awesome sweepers and great views. We stopped for lunch in Weaverville and then rt. 3 up to Yreka. My buddy met us up there and three of us were off to Ft. Bragg the next morning. We diverted a bit again from the master plan and took Gazelle Callahan road out of Yreka and got on Callahan-Cecilville road. That road was awesome, until we got to Cecilville, then it turned into a Goat Trail shelf road from hell about half way to 96…..all paved but very narrow. 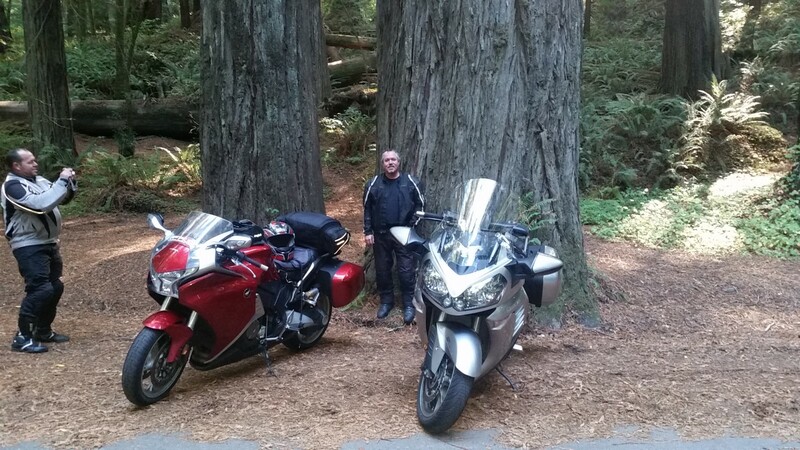 We jumped on 96 south to Willow Creek, then 299 back to Eureka and down 101 to the Avenue of the Giants, and then Rt. 1 down to Ft. Bragg. Route 1 down to the coast was very technical and fun, then suddenly you break out to the coast….spectacular….We got a great hotel in Ft. Bragg with rooms overlooking the shoreline. If I did it all over again I would have taken one day completely off the bike and stayed an extra day in Ft. Bragg. I really liked that town. Thursday- Ft. Bragg, Skaggs Springs, Vacaville. Skaggs was awesome, but too short!!! The Veefalo had the most fun on this section and simply devoured the corners. Had both knees down through this section…YEA BABY! Next through the “Valley” and to my buddies other house in Vacaville where we had a great dinner and maybe just a little partying. Friday- Vacaville to Ely, NV. Took 50 into Nevada and just laid down miles across the high desert. Again, fantastic scenery like we had the entire trip. You could see forever and might not have a corner for 20+ miles. Yep, it was time to wick it up…but who would do it first….I noticed my brother dropped back a bit…and then ZOOM as he flew past in the left lane. That FZ1 Two Brothers pipe was screaming its beautiful sound. I start to catch up…110…120…135….145 (Don’t tell Miguel)…The Veefalo was rock solid at speed, but we only stayed there a minute or so…OK, we got that out of our system. Saturday- Ely to Grand Junction. We decided to skip Moab so we would have an easy day back home on Sunday. On Sunday we headed back over Independence pass and back to home to Woodland Park. It was our shortest day and we were home by noon. I had time to give the Veefalo a good wash so I could get it back to Miguel the following day. Those PR4s still had some life left and I really liked the tires. I had 100% confidence and never felt any slips. The desert gets cold….I ran those heated grips for hours each day.. The Veefalo WILL power wheelie in first gear, as found out when I did a quick highway merge in CA. Never ever go on a big ride (6th gen) without a spare stator and RR (although my RR has never failed)..
That sounds like a great ride. I assume that the wx was good other that the rain into SLC. My only trip this year was San Diego to Seattle, to drop off one of my bikes for our son.